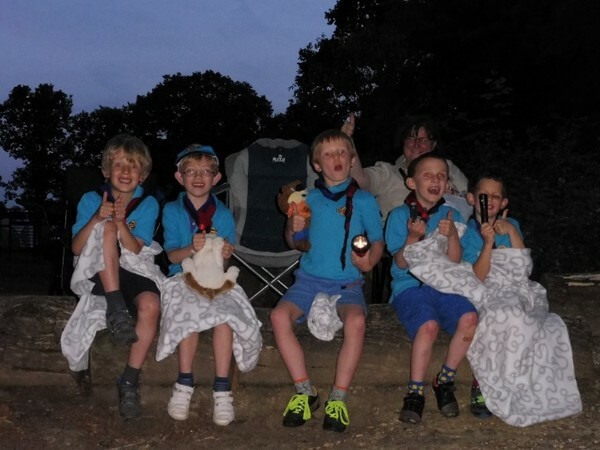 1st Welwyn Scout Group attended the first County Beavers in Tents at Well End Activity Centre on one of the hottest July weekends. The beavers assisted in erecting their tents before setting off on a series of 10 well organised activities such as erecting a flag – designed and built by the team and cooking dough twists over a campfire! The whole camp sing song was very popular and “making fire” was voted the most popular base activity by our beavers! The weekend finished with flag break and James Reynolds receiving his Chief Scout’s Bronze Award – well done James. A few photos of the event show what a brilliant time was had by all!